Ever called a plumber and then wish you’d called someone else? 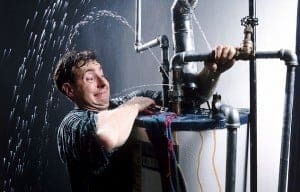 Many homeowners in Bergen County and Morris County have had bad experience with some NJ plumbers and plumbing companies in the past, and the experience can leave a sour taste in your mouth afterward. Many plumbers overcharge, can’t fix the problem, or take too long to complete the job. Some even act rude and unprofessional. After a bad experience with a NJ plumber, you may never want to call one again. Unfortunately, it’s not that simple. While many homeowners can take care of very basic repairs, some problems like sewer repair services will always be beyond your skill level. Leaking pipes can be hidden in ceilings or walls, and problems with the sewer main line are nearly impossible to take care of without professional equipment. Eventually, you’ll need a plumber. When you do, you’ll need a good NJ plumber. Bad plumber behavior shouldn’t turn you off to calling a local NJ plumber next time you need one. Good plumbers and plumbing companies will arrive quickly, act professional, and deliver great service at reasonable prices that make sense. At A1 Sewer & Drain Services, we pride ourselves on our devotion to quality service and customer satisfaction. We hire only the most skilled and experienced NJ sewer plumbers, all of whom are fully licensed and insured in the state of New Jersey. We offer fair, affordable prices for all our services, along with fast 45-minute response times and friendly, knowledgeable staff. As specialists in sewer and drain services, we offer sewer repairs, drain repair, sewer replacement, sewer installation, and more throughout north NJ. For great service from some of NJ’s best plumbers, including 24/7 emergency sewer repairs, call us any time at A1 Sewer & Drain. Need a Good NJ Sewer Plumber? Bad plumbers can make all kinds of mistakes. They can fail to solve the problem, or in some cases, even make things worse. They might act rude or unprofessional, show up late, or drag their feet finishing the work. At A1 Sewer & Drain Services, we strive to offer the best quality service to all our valued NJ customers. Our skilled and licensed NJ sewer plumbers always arrive on time, and we’ll never charge you until we’ve figured out the problem and you’ve agreed to repairs. Over the years, we’ve heard plenty of customer complaints about other companies. We’ve even been called in to fix problems that some shady plumber made worse. Here are some of the most common consumer complaints about bad plumbing service. Plumbers can vary in price as well as quality, and in some cases, a more reputable company might give a somewhat higher estimate. However, many subpar plumbers and plumbing companies in NJ will always quote higher than they need to. The cost of any plumbing or sewer repair job is influenced by several base factors, including the cost of labor and cost of supplies. However, when you ask around, you’ll find that you’ll get different estimates from different companies for larger projects. It’s also a bad sign if a plumber charges a suspiciously low price for services. Plumbing work isn’t cheap, and although prices can vary, even a novice plumber with a brand new license can get away with charging $35 an hour. If the bid seems too low, you might not get quality service. Shoddy drain and sewer repairs can cause more problems later, so it’s better to pay more for quality repairs once than to end up paying again in a couple of months. Although extensive plumbing and sewer repairs aren’t always cheap due to the labor and supplies involved, beware of an estimate that seems ridiculously high. If in doubt, and it’s not an urgent repair situation, shop around for estimates before you commit. At A1 Sewer & Drain Services, we provide fair, straightforward, up-front pricing for all our services. We offer free diagnosis of the problem, after which we’ll give you a reasonable cost estimate for the drain or sewer repairs you need. With some plumbers, the problem isn’t pricing or skill, it’s their attitude. No one wants to deal with a rude service professional, and a poor attitude is one way that bad plumbers and plumbing companies can get on a homeowner’s bad side. At A1 Sewer & Drain Services, all of our sewer repair plumbers conduct themselves with a cordial, professional attitude. We’re friendly, accessible, and always happy to help you out with your drain and sewer problems. Sometimes a NJ plumber can keep you waiting for hours for repairs. At A1 Sewer & Drain Services, we’ll never do this to a customer. Many of our jobs are urgent, emergency situations, and homeowners simply can’t afford to wait. If you have a collapsed sewer pipe or a clogged sewer line causing sewage backup, you simply can’t afford to wait. Every moment until a plumber gets there, the problems gets worse. At A1 Sewer & Drain Services, we guarantee a 45-minute response time for all our NJ drain and sewer service calls. We always provide same-day service for all your plumbing problems, ensuring that your drain or sewer line will be fixed as soon as possible. Sometimes plumbing companies in NJ hire inexperienced or incompetent staff, who aren’t always able to solve most plumbing problems. This can be a result of poor or insufficient training, or the lack of proper plumbing credentials. At A1 Sewer & Drain Services, we seldom come across a drain or sewer plumbing problem that we can’t solve. Our plumbers are highly trained and widely experienced with sewer and drain repairs, giving us the knowledge and skills to solve your problems quickly and effectively. Some plumbers drag their feet when it comes to finishing your work. They might just be lazy, or trying to make something look like it took more effort so that they can overcharge you. Either way, plumbing problems should be fixed as quickly as possible by a NJ plumber. An experienced local sewer plumber will have repaired similar problems many, many times, meaning we can fix the problem quickly and efficiently. To work as a plumber in NJ, you need to be both licensed and insured. However, some NJ plumbing companies may be shady or insincere about their license, qualifications, credentials, and insurance. To become a plumber, a person must be 21, and have gone through a long apprenticeship period, in which a master plumber will train them to diagnose, install, and repair plumbing. After meeting the requirement of four years of apprenticeship, they take a written exam. To qualify for the exam, they need practical, hands-on plumbing experience. This includes repairs, plumbing installation, and replacing or expanding existing plumbing systems. Along with a license, NJ plumbers also need insurance. In New Jersey, they’re required to have at least $500,000 in liability coverage to account for possible injuries, property damage, and product liabilities. Have you had a plumber insist that you pay cash, rather than a check or card? This is a bad sign. Even if they offer a discount in exchange for cash without a receipt, you should be wary. This can be a sign that the contractor or company is trying to cheat on their taxes by getting paid under the table. It’s also a good idea to have a receipt in case something goes wrong after the repairs. When you call us at A1 Sewer & Drain Services, you’ll never end up with shoddy repairs, overinflated pricing, late arrival times, or surly plumbers. Our team of experienced, licensed, and insured NJ sewer plumbers provide only the best service for all jobs, large and small. From minor drain cleaning to large-scale sewer main line installation, we put our all into every sewer and drain plumbing job, and it shows. With fair pricing, quality repairs, and excellent customer service, we’ve become a local leader for residential and commercial sewer repairs. For same-day service today, or to find out more, call us any time at A1 Sewer & Drain Services. At A1 Sewer & Drain Services, we specialize in working with sewer plumbing, drains, septic systems, and related aspects of wastewater disposal. Because we’re specialists, we’re more knowledgeable than general plumbers about the specifics of sewer repair, sewer cleaning, and drain repair. Serving both residential and commercial clients, we provide quality service, great prices, and some of NJ’s friendliest sewer plumbing contractors. 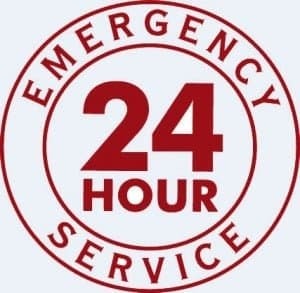 Call us any time for service today, including 24-hour emergency repairs, at 201-645-0888. For most sewer repair jobs, we can provide trenchless sewer repairs that fix the problem while sparing your yard and driveway. 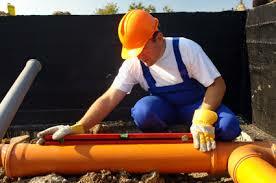 Trenchless sewer repair methods like sewer relining and pipe bursting can easily fix or replace a pipe, without any digging at all. Pipe lining involves inserting a cure-in-place pipe (CIPP) liner into the pipe, made from resin and fiberglass cloth. After it’s in place, we harden it with heat or UV, creating an impermeable and corrosion-resistant sleeve that patches cracks, leaks, and pinholes in the pipe. Pipe bursting allows us to replace sewer pipe without the need for extensive sewer excavation. Instead of digging up the pipe to access and remove it, we use a hydraulic bursting head to break the old, severely damaged pipe apart. A new pipe is pulled into place behind the bursting head, into the same location as the old pipe. To learn more about your options for trenchless sewer repairs or trenchless pipe bursting for sewer replacement, call us any time at A1 Sewer & Drain Services to talk to one of our experienced NJ sewer plumbers. Tree root incursion is one of the leading causes of broken or collapsed sewer pipes in Bergen County and Morris County. 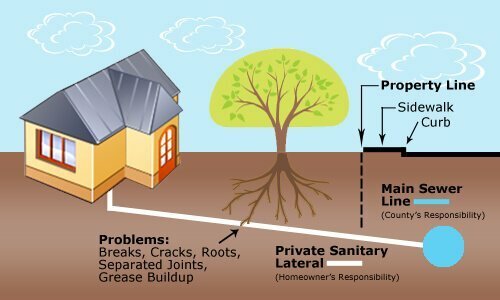 Tree roots can extend over 100 feet from the base of the tree, and as they seek out moisture and nutrients, they can be naturally drawn to existing cracks and small holes in your sewer main line. They enter inside the pipe, obstructing water flow and causing clogs. The pressure of the growing roots can also break the pipe, leading to sewer line collapse. At A1 Sewer & Drain Services, we use sewer cleaning with hydro jetting to break apart and wash away tough, stubborn tree roots. 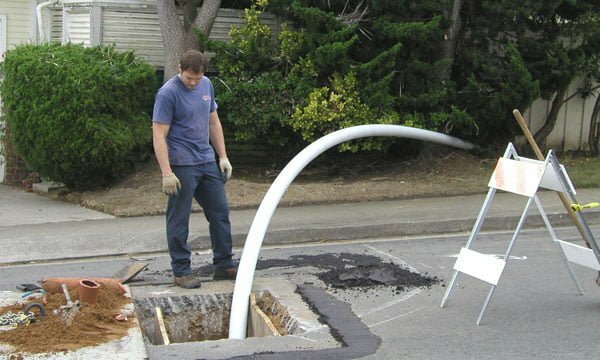 Afterward, we can use sewer repair techniques like pipe relining to patch up cracks and holes, preventing any further damage and keeping tree roots away in the future. 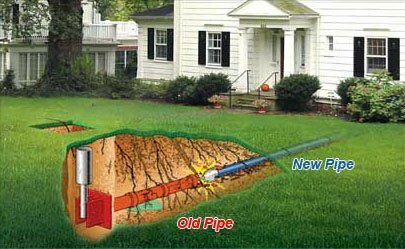 With either sewer excavation or trenchless pipe bursting, we can remove and replace a broken, burst, or collapsed sewer line/pipe– without digging a trench in your yard, or damaging paved areas above the pipe. Sewer pipe replacement is often needed in severe cases, like when a damaged pipe has collapsed completely and doesn’t have enough structural integrity for pipe lining to be effective. 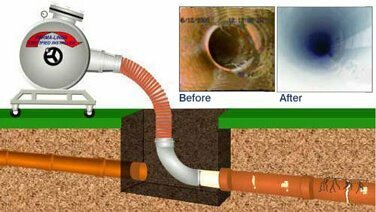 Using hydro jetting with water pressures of around 400 PSI, we can blast away clogs and debris that are blocking the flow of water through your sewer main line. Sewer cleaning helps eliminate clogs before they break the pipe from stress, and before sewer backflow can begin moving into your plumbing pipes and up your drains. To find out more about sewer cleaning, or to schedule hydro jetting today, call us any time at A1 Sewer & Drain Services. Need a Good NJ Sewer Plumbers? Call Us Today for 24 Hour Repairs, at 201-645-0888. At A1 Sewer & Drain Services, we’ll never provide anything other than the best possible service for all our clients. Providing both residential and commercial sewer repairs, sewer cleaning, drain repairs, and more, we strive for quality in everything we do. With fair pricing, friendly service, and 24-hour emergency repairs, our NJ sewer plumbers are always ready to help you solve even the most serious sewer and drain problems. For a great plumbing repair experience, call us today. Need a Good NJ Sewer Plumber? Call Us Today for 24 Hour Repairs, at 201-645-0888.